As we all hurtle headlong towards the annual commercial consumer festival otherwise known as Christmas, we are occasionally slowed down by the odd plaintive voice asking us to remember the real meaning of it all. This plea usually invokes the name of one of the greatest souls ever to walk this planet, but after a brief pause for reflection most of us carry on in pretty much the same way. But far from ignoring the real meaning of Xmas we are actually celebrating it. Christmas is a Capricorn festival related to the return of the Sun from its weakest darkest point in the annual calendar. It is meant to be about celebrating, and trying to enjoy some of the winter, giving and receiving presents, not about getting all puritanical and sanctimonious about someone who wasn’t even born in December anyway. Jesus was a Virgo, born in the year 7 BC, an explanation of this fact can be found in the article Is This the Birthchart of Jesus Christ ? The early church in their dual need to claim a birthdate for their founder and to establish their validity in a pagan world, did what countless other religions had done up to that point. They tried to hijack the pagan festival of Saturnalia. The only difference between the Christian attempt and all the others was their degree of success. Virgo is certainly a better fit for both the Puritan and work ethics of the Christian church, but who would have a national holiday in September ? Everyone has just been on holiday in Leo, what the Universe needs at this point is hard work to bring in the harvest otherwise everyone would starve during the winter and there’d be no Xmas parties at all. Jesus was a Virgo with a strong sprinkling of Cancer and Pisces. All that Virgin mother stuff was not meant to be taken literally. It means he was born under the sign of the Virgin ! When it comes to Christmas there is one figure that better symbolises the pagan meaning of the time. This is Santa Claus also known as Sinterklaas, a Dutch pronunciation of Saint Nicholas, the Greek bishop and gift giver of Myra. He is also known as Father Christmas or Kris Kringle. Elements of the personality of the Norse god Odin and the pagan festival of Yule have been drawn into the personality of Santa Claus. So who is Santa Claus and more to the point can we come up with a birthchart for him. Well Capricorn Research is always up for a challenge but is reluctant to make the trek to the North Pole to ask him. A quick check through Google gives a number of different sightings but only one clear date, the one for the anonymous publication of the poem “A Visit From St. Nicholas” (better known today as “The Night Before Christmas”) in the New York Sentinel on 23 December 1823. We don’t have a birth time for Santa but in this absence a noon chart often works perfectly as a symbol. It certainly does here. This is quite simply the most extraordinary birth chart Capricorn Research has ever seen. Of course the whole Santa thing is about celebrating the return of the light so the character would have to have a stellium in the early degrees of Capricorn. For such a figure of myth and fantasy, Neptune would have to be involved and a conjunction with the Sun would be essential. As an imagination stretcher, Mercury and Uranus as part of the stellium also fits well. But of course Santa’s whole purpose is to bring gifts to good boys and girls, so the opposition between this stellium and the noble gift bringing Jupiter exalted in the family sign of Cancer would also be required. This opposition is part of a Grand Cross including another opposition between Mars and Pluto. The Grand Cross is right on the Ascendant / Descendant / Midheaven / Nadir axis. But the utterly staggering thing is that Pluto and Mars are both at 0 degrees 1 minute of of the equinoctial signs, Aries and Libra. The Grand Cross, particularly one with as tight aspects as these is an aspect of tremendous challenge. It is literally like being pulled in 4 directions at once. One of the saddest things as children grow up is when they stop believing in Santa Claus. Not long before this stage they begin to ask the question, how is it that he can reach all of the houses in the whole world in one night ? As parents we answer by saying its all part of the magic, knowing in some way that said magic will soon be dispersed and lost. But if we were to say, oh its because he’s got a Grand Cross between the Sun, Mars, Jupiter and Pluto on the 4 Cardinal points, perhaps our loved ones would nod sagely and understand that he would have to in order to get round to everyone. The other thing to explain is the Venus / Saturn opposition but then if you think about living at the North Pole with a few reindeer and no female partner, this also fits the picture. So is this the birth chart of Santa Claus ? Well if it isn’t, it damn well should be. Loved this! I like the fact that all the stuff we are not supposed to be doing is of course the stuff we SHOULD be doing as it feels natural and right and in rhythm with the year. Yay! pressies! food! fires! 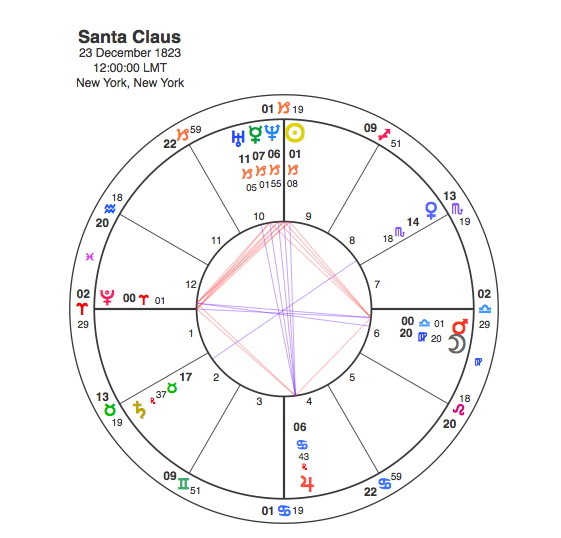 Would love to meet this santa guy, his chart looks interesting….